New season new habits! 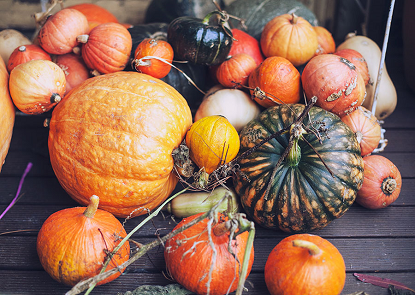 A few days ago Balazs and I decided to make a handful of autumn changes to our eating habits and to the way we store and buy fresh veggies and fruits. The main reason for this is that in the past few years we noticed that we eat much healthier in spring and summer but as soon as the cold weather kicks in, we get a bit lazy and tend to go with comfort foods that are not necessarily as healthy as they could be. Is it the same with you? For months I kept on hearing from everyone around me saying that I should ditch the last of my plastic containers or bags and switch to recycling cans and glass bottles. So yesterday that is exactly what I did. I got tons of baskets for the fridge to start grouping veggies by meals. 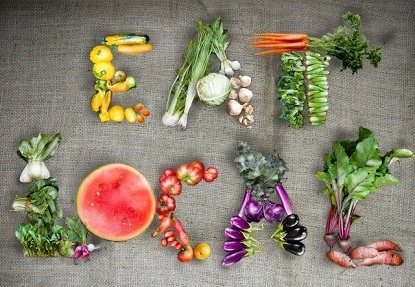 My friend Megan told me that grouping veggies by meals makes life easier and helps in making healthier meal choices. Makes sense, doesn’t it? - Apples can be stored on a cool counter or shelf for up to two weeks. For longer storage you should place them in a cardboard box in the fridge. - Pears will keep for up to a few weeks on a cool counter. To hasten the ripening put an apple in with them. - Cherries should be stored in an airtight container. Don’t wash cherries until ready to eat as any added moisture encourages mold. - Eggplant does fine left out in a cool room. Don’t wash it, eggplant doesn’t like any extra moisture around its leaves. - Tomatoes should never be refrigerated. 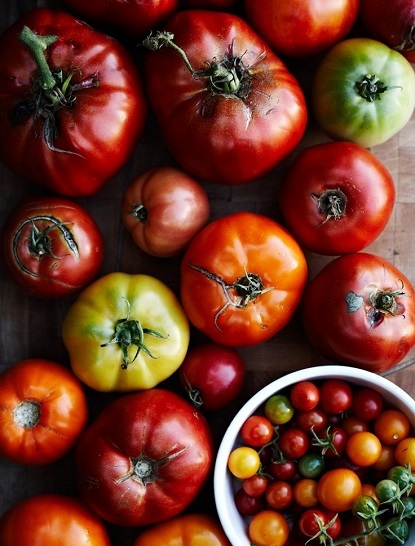 Depending on ripeness, tomatoes can stay for up to two weeks on the counter. To hasten ripeness place in a paper bag with an apple. - Zucchini does fine for a few days if left out on a cool counter, even after cut but if you wrap in a cloth and put it in the refrigerater it will last for longer. - Sweet Potatoes should be stored in a cool, dark, well ventilated place. Never refrigerate, since sweet potatoes don’t like the cold. - Brussels Sprouts if bought on the stalk, leave them on that stalk. Put the stalk in the fridge or leave it on a cold place. If they’re bought loose, store them in an open container with a damp towel on top. P.S: And this superfood mocktail. Yes, I eat way too much pasta and bread in winter and fall since it's very comforting but sadly not very healthy. I have no experience with ordered food-boxed so I am very interested to hear how you find them. Will you write about it? Anonymous, same here....Pasta and bread used to be our go-to autumn foods of comfort:) Btw: yes, I will totally post about it. 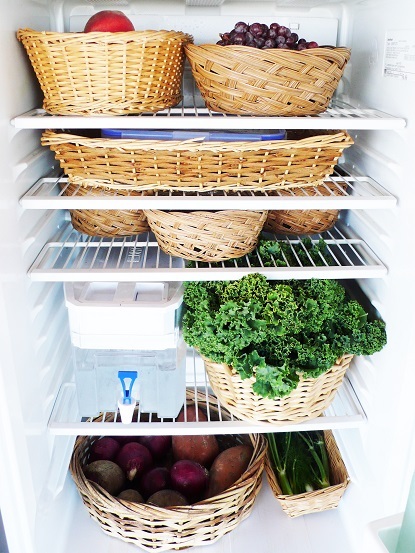 I love the idea of keeping your veggies in a basket inside the fridge. I'm too trying to get rid of my plastic containers! 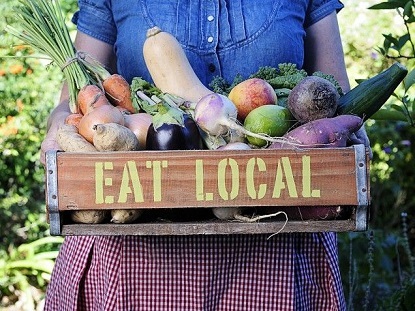 That list is awesome, and I never thought of baskets for produce before, interesting! My pleasure, skedian! Btw: I'm planning to start the VB6 for a month in October. It makes so much sense and I really want to see how it will change the way I eat or feel. So right, Lisa! I love what you said. i LOVE the baskets in the fridge!! tiffany, they are very handy too.